There haven't been a lot of updates recently - I've been focusing on work: drawing and writing my next big book about norse mythology. I have fiddled around with some xenos but there's nothing to show yet. Designing new species is hard. You want to hint at new technology and different physonomies, but doing that using existing bits is tricky. But today I got the urge to do something old school - something nostalgic and "warhammery" as a contrast to GWs current relentless barrage of golden warrior angels with big hammers. So, I picked up a tzeentchean sorceror, gave a new bird head from an empire mini griffon and turned him into a classic chaos champion. While I say old school at the same time the theme is completely new for me, as I've never painted a tzeench model. The plan is to paint it in a Realm of Chaos early 90s style and have a lot of fun with the shield doing a wierd face or eye motif of some sort. Nice headswap. 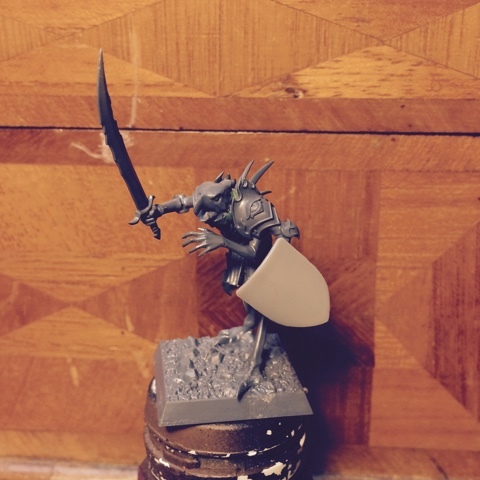 I know you're not really comfortable with greenstuff but that shield screams for some physical detailing. I think you could keep the sculpting pretty basic and let your freehands suggest the rest. I might do something similar but instead using trompe l'œil techniques. I'm convinced the stormcast eternals can be painted beautifully - they are fantastic miniatures in many respects. I'm just getting bored with the sameness of the models and the godawfully uninteresting background. I thought so too up until I read Quest for Ghal Maraz. That book and Jake's Stormcast convinced me into buying my own. I'm not going to push the subject more but I've gotta say one last thing. If you enjoy AoS for what it is, a narrative driven game where you and your opponent at least roughly need to agree upon what you want out of the game those books are essential. They give you scenarios to reenact and rules for where (which realm) it all happened giving another layer. With that said I'd personally recommend QfGM as it's an overall more enjoyable book and on a level you can actually relate to. This isn't the case for the first book tbh. I bought the first "rulebook" and were so let down by it there´s little chance of me buying something else for AoS in a while. I just can´t work up any enthusiasm for the setting and it doesn´t really feel like the writers can either. But if you like it that´s great! The game seems fun, but I´ll wait until they release something more up my alley. 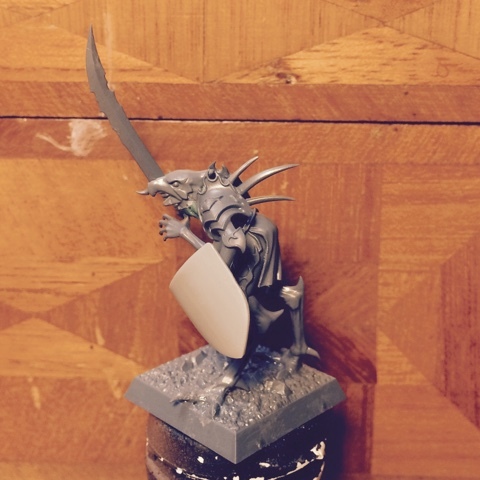 Like skaven or some new human, less mariney, faction. Awesome looking conversion! You managed to completely change the image of that Tzeentchean sorcerer model (he now look like a battle wizard... swords and sorcery as you said)! The griffon head fits really well with maintaining the Tzeentch theme. I look forward to seeing where the model goes! Yeah - I wanted more of a classic chaos champion than a straight up wizard. I`m quite pleased with that bird head - the original model could have benefited from something more different to the head of the robed plastic sorcerer. That's a very cool looking conversion! Is that greenstuff I spy?! I rarely see it among your conversions, which is a testament to your kitbashing fu. I can already see the awesome freehand that awaits in my minds eye! I really hate sculpting fiddly stuff. I simply don´t have the patience for it. Cheers! We'll see how old school it turns out in the end, but at least it'll be something different! Ha ha ha... you finaly put your hand on the fantasy.... I'm very curious about the following events.... Is it a one shot mini or the start of a warband.... 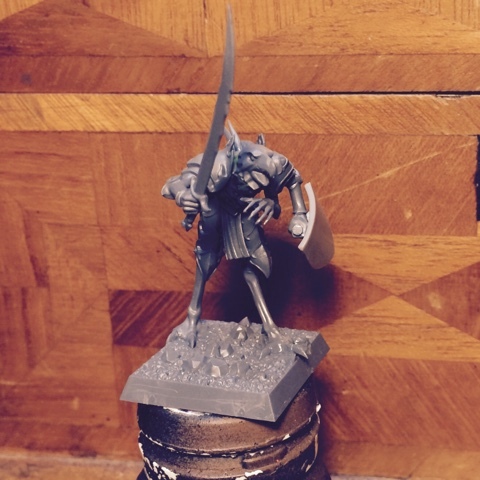 Anyway, having an Oldhammer mini made of Newhammer bits is great ! I wasn't expecting anything else from you mate. Excellent ! Where'd you find the book? I've been looking forever for a copy... Those tables are just the best! eBay. Cost me 95 £ with shipping. Had a damaged spine, but fixed it with some glue. Works for me, either that or pay the 150£ it usually sells for. Let me know if you want some photos of the tables, and I'll do my best.